Digital recording on your Windows computer allows you to easily document motions and votes, detailed discussions and action items. Creating accurate minutes is a snap, and the annotated recordings ensure participants have a detailed understanding of what happens at every meeting. What makes SoniClear software different from other methods of recording is that important meeting information is instantly accessible. You can play recordings from your own computer for review. In addition, you can share recordings on a network folder, flash drive, or on CD. Timestamped notes in the recording can be used to highlight important points during the meeting, making it quick and easy to locate every detail. Meeting Recorder 9 and Gov Recorder 9 have the same essential recording and transcription features needed to capture and review meetings. Meeting Recorder 9 is ideal for board secretaries and clerks who primarily need to record meetings, produce minutes, and play back recordings for their own review. Gov Recorder 9 has additional advanced features for government. This includes a free transcription program for use by multiple departments, plus network archiving and web streaming to make it even easier to share recordings with meeting participants. 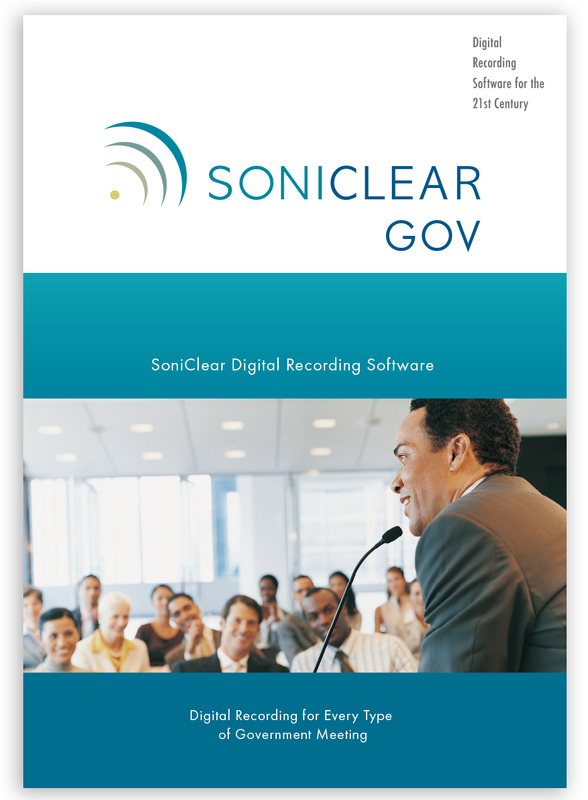 SoniClear software has been designed by digital recording experts to be reliable and easy to operate. You can start using SoniClear without any special training, since the controls on the screen look like a traditional hardware recorder. Going beyond just recording, SoniClear simplifies your process for archiving and reviewing meetings. SoniClear makes it easy to outline the events of the meeting in the recording. As discussions unfold, important points can be highlighted with time stamped notes. When listening to the meeting, any point can be accessed with one click. SoniClear is the modern, easy way to capture meeting information, and make it available to participants. You can relax, knowing that you will not miss any detail. Creating accurate minutes and reviewing meeting discussions is faster and easierwith SoniClear.